Developed by the parents of three boys under the age of four, Toddler Planes is a game even the littlest of kids can play all by themselves. The game is simple: pick a plane and then pick a background scene. Then watch your plane fly over the scene. 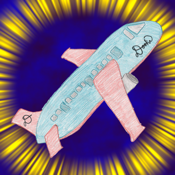 Complete with sound effects and detailed hand-drawn art, Toddler Planes is an app that your tot will love. Our 2-and 3-year-old testers guarantee it. Recommended ages: 1-3 years old.